It's Kill/Refurb/Marry time! This month's edition of the blog hop concerns favorite frozen treats in the parks. Now, the definition of "frozen treat" may vary from person to person - does ice cream count? If so, does it have to be considered a "novelty" or is Beaches & Cream's No Way Jose sundae eligible? Alternatively, does it only county if there's actual ice directly involved, like a slush or smoothie? Where does the Dole Whip fall in all of this?! One could arrive at many interpretations, but where I chose to land was in the "ice cream novelties cart" category. Limiting? Sure! But when was I known to ever back down from such a delicious challenge? Pat got one of these on our very first day in the parks last January expecting something of a lemonade slush. What he got instead was basically lemonade frozen solid in a cup. He was most disappointed, but then, isn't everybody? If you wanted something that literal, you could easily do it yourself. No magic here. Kill! Confession: I have never had a Mickey Bar. SACRILEGE! I know, I know. But... isn't it basically just your standard vanilla ice cream bar with milk chocolate coating? I mean, what's so great about that? Yeah, yeah, I know it's Mickey shaped, and yeah, I can see how biting off his ears could be most satisfying (you psycho), but still. Let's fancy him up, shall we? Maybe make him come in milk, dark, and white chocolate iterations, with a caramel or fudge center and chocolate chips or sprinkles on the outside? Nothing about Disney should be this plain! The chocolate-covered banana is (spoiler art) largely a frozen banana. Bananas are fruit! It is covered with chocolate, yes, but also nuts. Nuts are healthy! They have protein and are good for your heart! 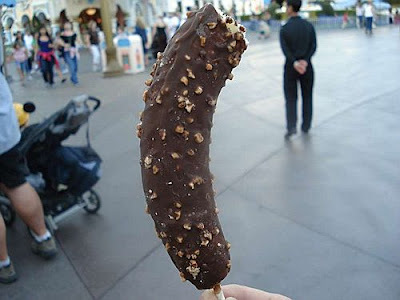 Therefore, the chocolate-covered frozen banana is by rights and logic a health food. Good job, you, for eating such a nutritionally sound thing that is also strangely delicious. And on vacation, no less! You are now justified in eating whatever you want for dinner. Enjoy, you health-conscious thing, you! I could see a Mickey bar place akin to Clarabelle Cow's place in California Adventure where YOU PICK YOUR TOPPINGS AND CUSTOMIZE IT. And they said a dream is a wish your heart makes when it's fast asleep... More like when you're on line for a snack in the Magic Kingdom. That would indeed be awesome. ALL THE SPRINKLES!!! Haha, yeah, this one is proving divisive! We were definitely on the same wavelength for the refurb! And I've never tried a frozen banana before but they sound really good! And dark chocolate is, like, totally good for you, so it would become a health food too!